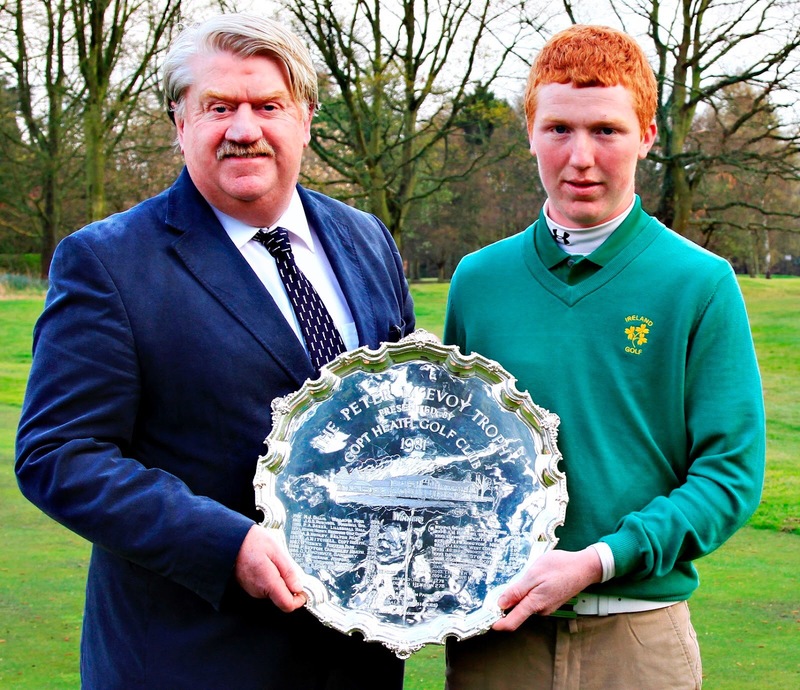 Tom MCKIBBIN (IRE) won the 39th Peter McEvoy Trophy after birdieing the second sudden death play-off hole. A beautifully judged chip over the front right bunker on Copt Heath’s first hole rolled straight into the cup. The Ulsterman had driven into the right hand fairway bunkers off the tee and could only get the ball up to the green side area. Meanwhile his opponents, Aaron MARSHALL (IRE) and Melan DHAUBHADEL (ENG), had both hit the fairway and found the green in regulation on the 440 yard par 4. Unsurprisingly neither could recover from the body blow of a chip in at such a crucial time. All three had pared the 18th, the first sudden death hole, missing makable birdie putts in the process. Tom becomes the third Irish winner following in the recent footsteps of Gavin Moynihan (2012) and Mark Power (2016). I would certainly class it as the biggest win of his career to date. Aaron MARSHALL (IRE) and Melan DHAUBHADEL (ENG) started the day with a 6 shot lead over the chasing pack and would be paired together over the final 36 holes. With the pins tucked away more on Day 2 the generally low scoring from yesterday was never likely to be repeated. Aaron shot a 71 (Ev) in the morning Round 3 while Melan could only manage a 74 (+3). Tom MCKIBBIN (IRE) 68, Jack BIGHAM (ENG) 68, Josh FALLOWS (ENG) 68, Luke O’NEIL (IRE) 69 and Max HOPKINS (ENG) 69 recorded the best morning rounds. McKibbin’s score moved him up to -5, 5 shots behind Marshall and 2 behind Dhaubhadel. Marshall gave up his lead primarily on the front nine in the afternoon. Bogeys on 1 and 5 were compounded by a poor drive on the 9th followed by a three putt which led to a double bogey. The door was clearly ajar for the chasing pack on the back nine. McKibbin was also 2-over after 7 holes of his final round. However an aggressive tee shot on the short 8 led to a birdie, another followed on the 10th before birdies on 15 and 17 saw him home in 69. At the time it felt as if his 277 (-7) total would prove to be one or two shy of the potential winning total. However, the two leaders, now settled into their final round, couldn’t move back out in fornt. Marshall played the final nine holes in even par but a bogey on the dog leg 16th brought him back to -7. Dhaubhadel, a new name to me, made some early mistakes in his final round but played the back nine in -1 and fought to the very end. When the cards were added up McKibbin, Marshall and Dhaubhadel had all finished on 277 (-7) and a sudden death play-off was required to determine our winner. As you can see from the Top 20 Results below Luke O’NEILL 68 and Max HOPKINS 67 also continued their strong play into the afternoon to secure high finishes. Well done to Copt Heath G.C. too on another successful tournament. It was good to see some reasonable crowds following the players. The relatively modest 6,541 yard course once again proved to be a good test and delivered another impressive champion. Melan DHAUBHADEL (ENG) 68 64 and Aaron MARSHALL (IRE) 65 67 share the Day 1 lead at Copt Heath G.C. on 132 (-10). This is a new record for the competition where previously the best opening 36 holes total was 133 (-9) recorded by Jake Amos (ENG) in 2005. Both players took advantage of favourable conditions. Preferred Lies had generously been allowed and with sunny intervals and a modest breeze the order of the day low numbers were certainly available. Melan’s best of the day 64 (-7) in Round 2 included 8 birdies. Meanwhile Aaron’s 65 in Round 1 was unblemished with an eagle and four birdies recorded. Whilst he shot a 67 in the afternoon he may remember it better as it included a hole-in-one on the 3rd. Harry LORD (ENG) is 3rd after two rounds of 69 (-4) with Max KENNEDY (IRE) 4th after a 71 and 68 (-3). The Top 40 and Ties cut fell at 149 (+7) with 43 players set for the final 36 holes tomorrow. The record low score for the overall 72 holes is 272 (-12). The 39th Peter McEvoy Trophy will be contested on Wednesday 17th and Thursday 18th April at Copt Heath Golf Club in Solihull, England. The McEvoy Trophy is a 72 hole scratch stroke play medal competition played over two consecutive days by boys aged under 18 (on 1st January 2019). The format, limited daylight and the greater risk of poor weather in April means the field is restricted to 72 players. All competitors play the first 36 holes on Day 1, playing in groups of three. The leading 40 players (and ties) then return for the final 36-holes on the following day, which is played in two-balls. A two tee start is used on both days. In the event of a tie the result will be decided by a ‘sudden death’ play-off, utilising holes 18, 1 and 9. The Winner receives a small replica salver and a voucher for £250. A total prize fund of around £1,000 is shared out amongst those players finishing in the Top 8 places (and ties). This year the handicap entry ballot fell at +0.3 highlighting the quality of the field. Three members of the nine man GB&I Jacques Léglise trophy team that beat Europe last August in Finland have entered and headline the field; these are Archie DAVIES (WAL), Max HOPKINS (ENG) and Tom MCKIBBIN (IRE). Joseph BYRNE, Max KENNEDY, Odhrán MAGUIRE, Aaron MARSHALL, Tom MCKIBBIN and Luke O’NEILL will all be travelling to the West Midlands as part of a strong looking Golf Union of Ireland squad. Kennedy (14th in 2018), Maguire (19th), Marshall (3rd) and O’Neill (42nd) are all returning after playing last year so should be better for the experience. However, it is perhaps McKibbin, the Holywood protege, that represents their best chance of finding a successor to the two previous Irish winners Gavin Moynihan (2012) and Mark Power (2016). Matt FREEMAN, Josh HILL and Max HOPKINS are the three English boy internationals competing. Freeman has recorded top 10 finishes in the Henry Cooper Junior Masters and Carris Trophy over the last two years and will be hoping to improve on his 17th place in 2018. Hopkins, winner of the 2017 Telegraph Vitality Junior Golf Championship when he was just 14, continues to show huge promise. Finally Dubai-based Hill, now 15 and with the lowest handicap in the field (-4.8), is considered to be one of the most promising GB&I youngster’s. Having played on the MENA Pro Tour throughout the winter he should arrive well prepared and could well breakthrough in 2019. 2018 Welsh Golfer of the Year Archie DAVIES, who performed well for the full Welsh men’s team at last week’s European Nations Championship in Sotogrande, Spain must also start as one of the favourites. His win at the 2018 Irish U18 Boys Open Amateur Championship clearly demonstrates he has what it takes to compete a this level. Shergo AL KURDI, born in England but representing Jordan, is an interesting entry. Like Josh Hill he has been playing in the Middle East during the winter and showed that he maybe ready to step up by co-winning the Duncan Putter at Southerndown G.C. last weekend. Charlie Strickland is the only player to complete the Putter / McEvoy double in April 2017. Corhampton’s Jamie MARKWICK and Lindrick’s Callum MACFIE may also be worth keeping an eye on. Like Aaron Marshall they have some Copt Heath form to fall back on, finishing 10th and 13th last year respectively. Unfortunately this year’s dates clash with the French International Boys’ U18 Amateur Championship which starts on 18th April and is being played two weeks later than last year. Enrique Dimayuga, Habebul Islam, George Leigh, Ben Pierleoni and Ben Schmidt are all playing at Les Aisses G.C. Scottish Golf have disappointingly given the event a miss this year. The Scottish Boys’ Open Championship was played at West Kilbride last week (10-12 April) and they have the Battle Trophy and a Boys U16 Quadrangular match scheduled for the Easter bank holiday weekend (20-22 April) making it hard for them to accommodate it. Perhaps Cameron GALLAGHER or Andrew THORNTON, who have entered individually, can become the first Scottish winner. Finally there are very few entries from the Midlands. 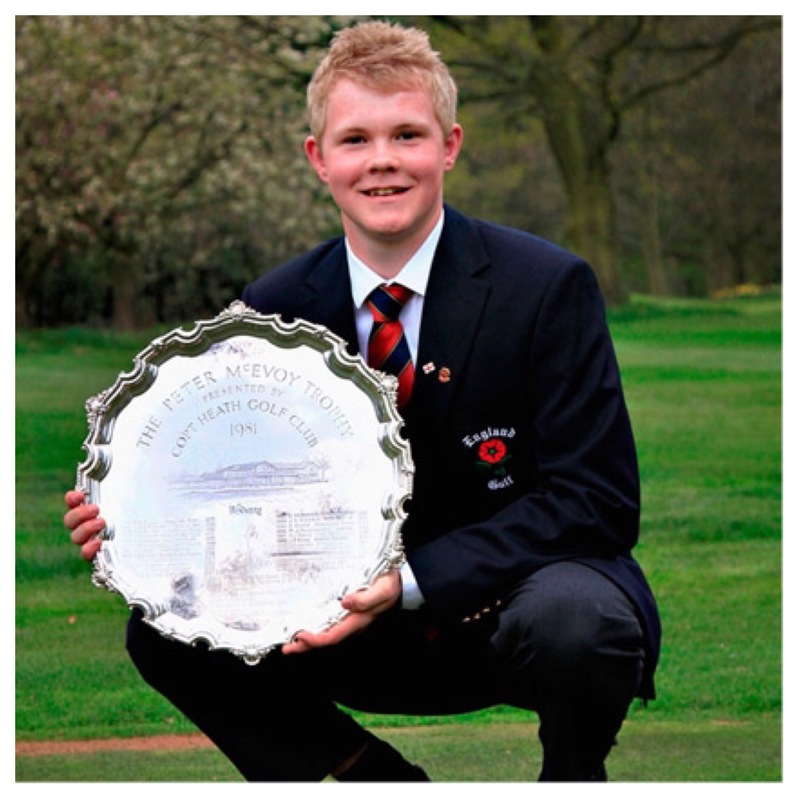 Perhaps the closest is Jack SEVERN from Cleobury Mortimer who will be hoping to follow in the footsteps of fellow club member Emily Price who won the English Girls’ U15 Open Amateur Championship at Copt Heath in July 2014. After last year’s heavy rain I am pleased to report that the weather forecast (as at Monday 15th April) looks very promising for both competition days. Wednesday 17th April – Light Cloud / Wind 7 mph E / Temp. Min. 8°C, Max. 16°C. Thursday 18th April – Sunny Intervals / Wind 12 mph E / Temp. Min. 7°C, Max. 19°C. Harrison ARNOLD won the 2018 Peter McEvoy Trophy at Copt Heath G.C. Reduced to 36 holes for the first time in its history due to heavy rain the Castle Royle player recorded rounds of 72 and 67 for a 139 (-3) total. Josh TURNOCK (Prestbury G.C.) and Aaron MARSHALL (Lisburn G.C.) came 2nd and 3rd respectively on -2 with count back rules separating them. Overnight leader Marshall bogeyed two of his last three holes to reverse out of the title. Here is the Golfing World video of the 2018 Peter McEvoy Trophy including an interview with Harrison. Copt Heath Golf Club is the permanent home of The Peter McEvoy Trophy. Copt Heath, despite its name, is essentially a parkland course. The current course was designed and built in 1913 by Harry Colt, the famous architect, and is predominantly flat but well protected with around 95 deep bunkers. The course measures 6,541 yards and has a par of 71, made up of 2 par 5’s, 13 par 4’s and 3 par 3’s. The front nine is shorter at 3,216 yards (par 35) but is tighter. The more expansive back nine is played over 3,325 yards (par 36). Legendary British Amateur golfer Peter McEvoy OBE has been a member of Copt Heath for 54 years. If you would like to learn more about his career then click this link for my profile – Peter McEvoy. Following Peter’s Amateur Championship victories in 1977 and 1978 Copt Heath made him an honorary life member. He was also invited to suggest a way in which the Club could commemorate his achievements. He chose a 72 hole boys competition to be held annually at Copt Heath. Starting in 1981, The Peter McEvoy Trophy was originally held during August. In 1985, at the request of the English Golf Union, it was moved to April, where it has stayed ever since. This request was prompted by a wish for an early season national competition to assist the home nations with the selection of their teams ahead of the Boys Home Internationals and European Championships held later in the year. As Peter McEvoy’s playing achievements and influence grew, culminating with him becoming a Great Britain and Ireland (GB&I) men’s selector and Walker Cup captain, so has the prestige of the competition. Of course having a stellar past winner’s list also adds to the gravitas. 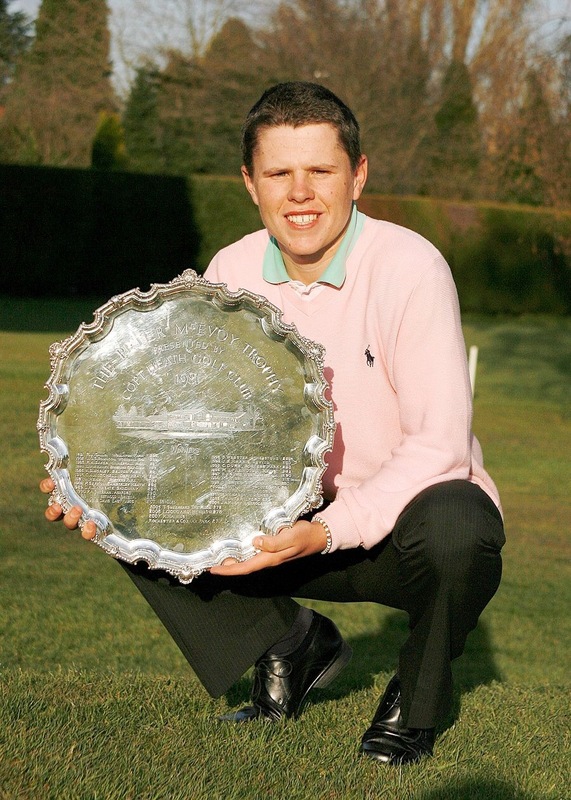 The McEvoy remains one of the leading British junior golf events to this day. The Peter McEvoy Trophy has an enviable list of former winners, reflecting both the quality of the annual entry but also the fair challenge presented by the course for players of this age. 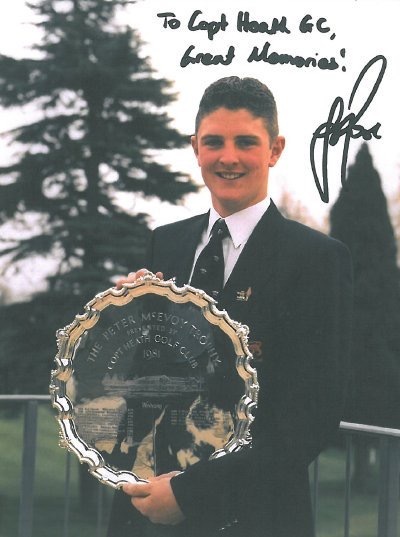 1997 Philip Rowe (West Cornwall) – now Assistant Coach for UNLV Men’s Golf. In 2013 Justin Rose became the first McEvoy Trophy winner to win a Major Championship, when he won the U.S. Open at Merion GC. He of course went on to also win Gold at the 2016 Rio Olympics. Bradley Moore – 4th (283 -1, 2012), 1st (287 +3, 2013), 2nd (281 -3, 2014), 2nd (280 -4, 2015). In addition to the winners listed above many other notable amateur and now professional golfers have competed over the years. These include (in alphabetical order): – David Boote, Jamie Bower, James Byrne, Stuart Cage, Paul Casey, Ashley Chesters, Lee Corfield, Mark Crossfield (@4golfonline), Paul Cutler, Jack Davidson, Joe Dean, Nick Dougherty, Luke Donald, Bradley Dredge, Scott Drummond, Paul Dunne, Simon Dyson, Greg Eason, Jamie Elson, Harry Ellis, Oliver Farr, Kenneth Ferrie, Oliver Fisher, Tommy Fleetwood, Mark Foster, Ewen Ferguson, Grant Forrest, Scott Gregory, Tyrrell Hatton, David Horsey, David Howell, Jack Hume, Simon Hurd, Andrew Johnston, Simon Khan, Nathan Kimsey, Tom Lewis, David Lynn, Nick Marsh, Jack McDonald, Dermot McElroy, Ross McGowan, Robert MacIntyre, John Morgan, James Morrison, Jimmy Mullen, Bradley Neil, Max Orrin, John Parry, Jim Payne, Eddie Pepperell, Van Phillips, Alfie Plant, Garrick Porteous, Iain Pyman, Robert Rock, Jamie Savage, Chris Selfridge, Jack Senior, Callum Shinkwin, Jack Singh Brar, Lee Slattery, Jordan Smith, Michael Stewart, Andy Sullivan, Graeme Storm, Connor Syme, Ben Taylor, Jonathan Thomson, Ashton Turner, Sam Walker, Anthony Wall, Danny Willett, Oliver Wilson, Tom Whitehouse and Chris Wood. Copyright © 2019, Mark Eley. All rights reserved. Here is the Golfing World video of the 2018 Peter McEvoy Trophy including an interview with the winner, Harrison Arnold. Harrison Arnold turns 18 next week. Today he started the celebrations early by adding his name to the prestigious Peter McEvoy Trophy at Copt Heath G.C. Harrison shot an impressive final round of 67 (-4) for a 139 (-3) total and a fully deserved win. His 67 was 2 shots better than any other player and was recorded on a day when the average score was 74.1 by the 72 strong field. 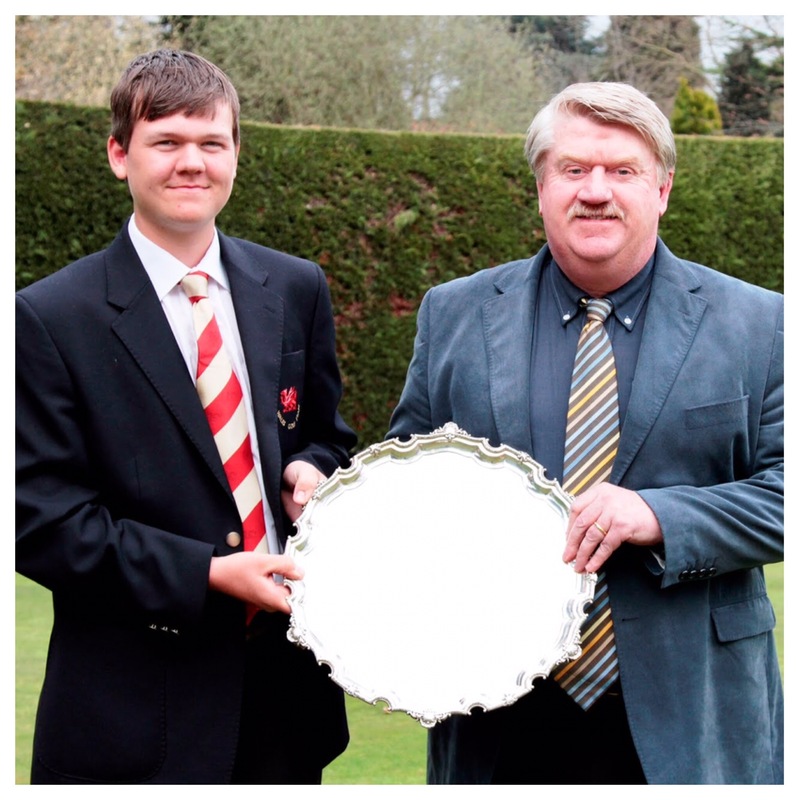 Josh Turnock (Prestbury G.C.) and Aaron Marshall (Lisburn G.C.) came 2nd and 3rd respectively on -2 with count back rules separating them. Harrison came out on top after heavy rain saw the organisers cancel yesterday’s second round and reduce the normally 72 hole event to just 36 for the first time in it’s 38 year history. This decision seemed fully justified when rain started to fall heavily this morning and mist drifted in on the north easterly wind. Ultimately, a one hour suspension in play was required at 11.20am, 30 minutes before the leaders were due to start today’s final round. When play re-started the rain had passed and the remainder of the day was dry, albeit cold and still misty. Harrison, from Castle Royle G. & C.C., started the day in tied 15th place after recording a 72 (+1) in Round 1. As this was his first McEvoy and as no practice rounds had been possible on Tuesday this was a credible effort for his first ever round at Copt Heath. However, few if any of the spectators considered him a likely winner as play got underway on Day 2. He was after all 5 shots back of the overnight leader Aaron Marshall (-4) and had a total of 21 players on the same or a better opening score than him. If that wasn’t enough he had not received any England Golf recognition to date, has no World Amateur Golf Ranking and was placed a lowly 2,516th in the Scratch Players World Amateur Ranking. Despite an encouraging tied 7th place finish at last week’s Scottish Boys’ Open Championship he was surely not the man to come through the field on what was clearly going to be a difficult playing day. We let Harrison set off with playing partners Barclay Brown and Jensen Hull in relative solitude as the ‘gallery’ waited for the final pairings, who were teeing off an hour later, and from whom we thought the winner must surely come. Harrison made a good start to his round negotiating Copt Heath’s difficult opening holes safely. Late birdies on the front nine saw him move into the top 10 on -1. However, it wasn’t until we saw his birdies on 13 and 15, and that he had moved to -3, that we realised he could be a factor in the outcome of the tournament. Subsequent reports suggested that he had left himself a 6 footer for par on the last after a poor first putt and that he had bravely holed it to finish with a 34 (-2) on the back nine. Meanwhile most eyes during the round were focussed on Ulster’s Aaron Marshall and playing partners Harry Goddard (Hanbury Manor G.C.) and Allan Hill (Athenry G.C.). Aaron dropped two early shots before quickly recovering them. He then settled down and played error free golf for the next 10 holes. He missed good birdie opportunities at 14 and 15 but with a 1 shot lead the expectation of the watching crowd was that he would calmly par in and collect the trophy; he was playing so nicely at this point. The 16th is one of Copt Heath’s tougher holes, a long right to left dog leg to a small green in the corner of the property. Aaron quickly dispelled any thoughts we had that this may be the hole where his run of pars could come to an end. A beautiful tee shot drew round the corner finding the middle of the fairway and shortly afterwards a mid-iron safely found the front right portion of the green. Job done. His first putt was well struck coming up no more than two feet before the hole. Then the first sign of nerves or perhaps simply bad luck – remember the whole field had walked around this wet green and hole during the day. The short par putt lipped out. It was now game on. News quickly filtered back to the clubhouse and Harrison was persuaded that there may be some merit in warming himself back up in the practice net behind the 18th green. With others having by this time fallen by the wayside it was increasingly clear that the winner would be one of these two players. Aaron, now tied for the lead, composed himself and despite pushing his tee shot on 17 played an excellent recovery over the tall guarding trees to 15 feet. His downhill birdie putt just missed. The thinking at this time was that Aaron had every chance of still winning in regulation. A birdie being more than possible on the short finishing hole, arguably the easiest on the course. In fact many of the frozen spectators were pulling for him to do so, the thought of a play-off not being overly welcome. When his iron found the centre of the well bunkered fairway his prospects looked good. Unfortunately he mis-clubbed or maybe adrenaline got the better of him. Either way his short iron approach ended up 30 feet over the flag at the back of the green. It quickly became clear to the 150 or so spectators that a play-off may not be required after all but not for the reasons we were expecting or hoping for. These fears became very real when Aaron gave his first putt an almighty wallop finishing 7 feet past the flag. The par was missed and everyone’s eyes turned to the man behind us hitting balls into the net. Harrison Arnold had quickly gone from play-off hopeful to being our champion. The old sporting cliche ‘it’s never over until it’s over’ came to mind as I drove away from my home club. Although the late twist increasingly seems to be the norm in amateur golf events nowadays. It was hard not to feel a little sorry for Aaron who had played well and will surely win elsewhere but no one could argue that Harrison hadn’t earned it with a great final round and strong finish. The 39th Peter McEvoy Trophy will be held on 17th and 18th April 2019. For the first time in its 38 year history The Peter McEvoy Trophy will be contested over 36 holes. The decision to reduce the 2018 event from the traditional 72 holes was taken at the conclusion of Round 1. Copt Heath G.C. had given it a go but it had quickly become clear that, with trollies understandably also being allowed, continued intensive play over two full days was not in the best interests of an already saturated course. The McEvoy has been reduced in length just four times in it’s history. 63 holes were played in 1992, 2008 and 2009 and 54 holes in 1998 when Justin Rose was the winner. Play started on time at 7.30 am and it was one of the first starters who would record the best round on a cold and drizzly day in the West Midlands. Starting in the first group off the 1st tee Aaron Marshall from Lisburn GC shot a 67 (-4) and now leads by 1 shot. Marshall had 7 birdies in his round, including four in row between holes 9 and 12. Two late bogeys on 16 and 18, interspersed with a birdie on 17, took a little shine off a round which suggested that conditions were not as bad as some had feared may be the case when the course had been closed yesterday. In what was generally a good day for the Irish party two of their other players also find themselves within striking distance. Allan Hill 68 (-3) and David Kitt 70 (-1), both from Athenry G.C., enjoyed solid opening rounds and find themselves in the top 6. Hanbury Manor’s Harry Goddard 68 (-3) sits in tied 2nd place alongside Hill. The highest WAGR ranked player in the field enjoyed birdies at 6, 10, 14 and 18. Will Hopkins from Belton Park and David Li, the only German entrant, both shot 69 (-2) to finish day 1 tied for 4th. 21 players, including England quartet Conor Gough (70), Callum Macfie (70), Matt Freeman (70) and Barclay Brown (72), are within 5 shots of the overnight leader so an 18 hole shootout is guaranteed for tomorrow. The 38th Peter McEvoy Trophy will be contested on Wednesday 11th and Thursday 12th April at Copt Heath Golf Club in Solihull, England. The McEvoy Trophy is a 72 hole scratch stroke play medal competition played over two consecutive days by Under 18 Boys (on 1st January 2018). Live Scoring on the Club’s website – updated after each nine on Day 1 and more frequently for the leaders on Day 2 – makes it easy for family, friends and other interested observers to keep up to date with play. I will post a link once it becomes available on the morning of Wednesday 11th April. The handicap entry ballot fell at +0.3 this year. Click here to view the successful entrants and McEvoy Trophy Rd 1 Start Times and Rd 2 Start Times. Aled Greville (WAL) and Gregor McKenzie (ENG) were late withdrawals from the field, replaced by Dani Hoof (ENG) and Harrison King (ENG) respectively. Barclay Brown, Enrique Dimayuga, Matt Freeman, Harry Goddard, Tom Gregory, Max Hopkins and Ben Pierleoni. John Brady, Charlie Denvir, Allan Hill, David Kitt, Odhran Maguire, Aaron Marshall and Luke O’Neill. Lewis Irvine, Aidan O’Hagan, Calum Scott, Greg Dalziel and Jack Broun. Tom Matthews and Archie Davies. John Brady (IRE) won the Irish U16 Boys’ Championship in 2016 and comes with experience of Copt Heath. He finished 39th in 2016 and 27th in 2017. Other Irish entries arriving in form include Luke O’Neill who won the Connacht Golf U18 Boys Open at Carne last week and Charlie Denvir who finished tied 4th at the Duncan Putter at Southerndown G.C. today. Of the others playing last year, of which there are not many, Barclay Brown (ENG) had the highest finish, 8th. He was also 13th in 2016 so should hopefully go well again. Greg Dalziel (SCO), winner of the 2017 Scottish U18 Boys’ Amateur Championship and runner up last week at the Scottish U18 Boys’ Open Championship, leads a strong Scottish contingent. No Scottish player has ever won the Peter McEvoy Trophy but 2018 could certainly be their year. Harry Goddard (ENG) is the highest ranked player in the field – WAGR 487 / SPWAR 535. Having played in 2016 (44th) and 2017 (32nd) he will be looking to record a strong early season result. 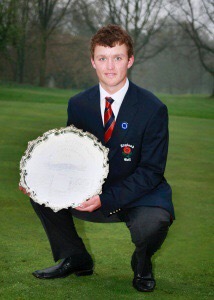 Conor Gough (ENG) appears to have stepped away from the England Golf set up but remains one of GB&I’s better juniors. A former U14 Reid Trophy champion he finished tied 12th last year and won 5 of his 6 matches at last year’s Boys’ Home Internationals. Max Hopkins (ENG) and Calum Scott (SCO) are two of the younger entries worth keeping an eye on. Max won the Telegraph Vitality Junior Golf Championship in November 2017 and finished 2nd in last year’s McGregor Trophy (English U16 Open). Whilst Calum won the Scottish U16 Boys’ Championship in 2017 and also starred for Scotland in last year’s Boys’ Home Internationals. David Kitt (IRE) was runner up in the 2017 Irish Amateur (Close) which enjoyed a strong field and certainly raised his profile. Archie Davies (WAL) who is a member of Carlisle G.C. also arrives in good form having finished tied 4th at Montrose in the Scottish U18 Boys’ Open Championship. In passing I note there are very few entries from the Midlands. I wonder if this is the first McEvoy where there hasn’t been an entry from within c.40 miles of Copt Heath. The English Midlands has been badly affected by the snow and rain seen across Britain in the year to date. In March the course received 115mm of rain, with a further 40mm falling over the recent Easter weekend. Despite being sand based the course is inevitably wetter than the Club would like and greens / general presentation understandably behind schedule. Persistent rain on Monday 8th afternoon and Tuesday 9th morning saw the course closed on Tuesday. Therefore very few competitors will have played a practice round before the competition starts tomorrow. ‘Preferred Lies’ will also be necessary during the event. Wed 11th April – Light Rain & Breezy / Wind 10 mph NW / Temp. Min. 7°C, Max. 9°C. Thur 12th April – Cloudy & Breezy / Wind 12 mph NW / Temp. Min. 7°C / Min. 13°C. Copt Heath Golf Club is the home of The Peter McEvoy Trophy. The competition is run by the Club and administered by their staff and member volunteers. Legendary British Amateur golfer Peter McEvoy OBE has been a member of Copt Heath for 53 years. If you would like to learn more about his career then click this link for my profile – Peter McEvoy. Following Peter’s Amateur Championship victories in 1977 and 1978 Copt Heath made him an honorary life member. He was also invited to suggest a way in which the Club could commemorate his achievements. His response was a 72 hole boys competition to be held annually at Copt Heath. Starting in 1981, The Peter McEvoy Trophy was originally held during August. In 1985, at the request of the English Golf Union, it was moved to April, where it has stayed ever since. This request was prompted by a need for an early season national competition to assist the home nations with the selection of their teams ahead of the Boys Home Internationals and European Championships held later in the year. As Peter McEvoy’s playing achievements and influence grew, culminating with him becoming a Great Britain and Ireland (GB&I) Men’s selector and Walker Cup captain, so has the prestige of the competition. Of course having a stellar past winner’s list also adds to the gravitas. 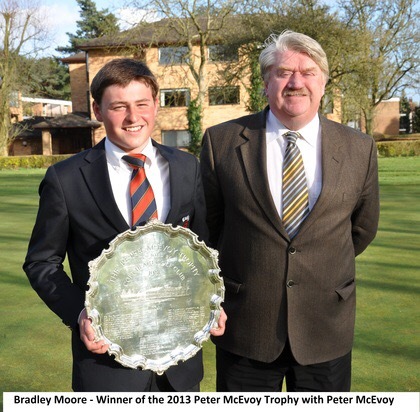 The McEvoy is without question one of the “must enter” British Junior golf events. An in form Charlie STRICKLAND from Ham Manor Golf Club, near Littlehampton on the south coast of England, won the 2017 McEvoy Trophy. His rounds of 70 72 68 and 66 gave him a -8 total on the par 71 Copt Heath course. Having won the Duncan Putter at Southerndown GC the week before, the McEvoy represented a second big win for Charlie in the space of just a few days. These include (in alphabetical order): – David Boote, Jamie Bower, James Byrne, Stuart Cage, Paul Casey, Ashley Chesters, Lee Corfield, Mark Crossfield (@4golfonline), Paul Cutler, Jack Davidson, Joe Dean, Nick Dougherty, Luke Donald, Bradley Dredge, Scott Drummond, Paul Dunne, Simon Dyson, Greg Eason, Jamie Elson, Harry Ellis, Oliver Farr, Kenneth Ferrie, Oliver Fisher, Tommy Fleetwood, Mark Foster, Ewen Ferguson, Grant Forrest, Scott Gregory, Tyrrell Hatton, David Horsey, David Howell, Jack Hume, Simon Hurd, Andrew Johnston, Simon Khan, Nathan Kimsey, Tom Lewis, David Lynn, Nick Marsh, Jack McDonald, Dermot McElroy, Ross McGowan, Robert MacIntyre, John Morgan, James Morrison, Jimmy Mullen, Bradley Neil, Max Orrin, John Parry, Jim Payne, Eddie Pepperell, Van Phillips, Alfie Plant, Garrick Porteous, Iain Pyman, Robert Rock, Philip Rowe, Jamie Savage, Chris Selfridge, Jack Senior, Callum Shinkwin, Jack Singh Brar, Lee Slattery, Jordan Smith, Michael Stewart, Andy Sullivan, Graeme Storm, Connor Syme, Ben Taylor, Jonathan Thomson, Ashton Turner, Sam Walker, Anthony Wall, Danny Willett, Oliver Wilson, Tom Whitehouse and Chris Wood.